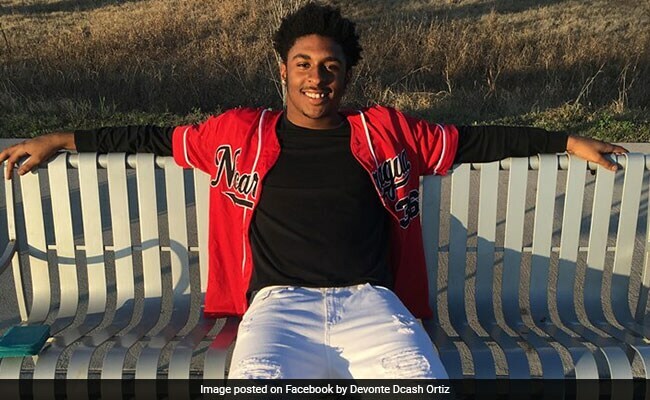 Devonte Ortiz (19) was setting off fireworks with his friends at their apartment complex and that upset the man, Jason Roche. Ortiz's family and friends have fondly described him as an A/B honor roll student and football star. In the earliest hours of the Fourth of July, Austin police received a 911 call about an escalating argument on the southeast side of the Texas city. A man was pointing a gun at the head of another man in the parking lot of an apartment complex, the caller said. Jason Roche, 41, was apparently upset that 19-year-old Devonte Ortiz was setting off fireworks with his friends at their apartment complex, according to a copy of an arrest affidavit provided to The Washington Post. By the time police arrived around 1:30 a.m. Wednesday, it was too late: Ortiz had been shot, authorities said. He was taken to a hospital where he was later pronounced dead. Roche told police he had asked Ortiz and his friends to stop shooting off fireworks earlier that night, the affidavit stated. When they didn't, Roche said he confronted the group a second time - then shot Ortiz after he said the teenager also reached for a gun, police said. It was a matter of self-defense. However, police would later review cellphone videos taken at the scene and discovered they told a different story. In the videos, Roche "is observed displaying a firearm at Ortiz, reholstering the firearm then displaying the firearm multiple times," the affidavit stated. "The video depicts Roche following Ortiz around the car and they argue with each other." Roche's father was also outside, police said, and attempted to intervene. Video footage showed Roche's father and Ortiz "engage in a verbal altercation and mutual shoving of each other," resulting in the elder Roche falling to the ground, the affidavit stated. It was then that Roche shot Ortiz, police said. Ortiz, it turns out, was not armed when he was shot and was "moving away from the firearm and not lunging toward it as stated by Roche," the affidavit stated. Roche was arrested Friday and charged with first-degree murder, police said. He is being held at the Travis County Jail on a $250,000 bond, jail records show. Police found a Taurus handgun and a Mossburg AR-15 style rifle in the parking lot near where the shooting occurred, the affidavit stated. Austin police representatives did not respond to requests for additional information on Saturday. Meanwhile, the shooting has devastated Ortiz's family and friends, who described the teenager as an A/B honor roll student and football star at William B. Travis High School, from which he had graduated in 2017. On Friday night, several dozen people gathered at the high school to remember Ortiz, holding red and white balloons and lighting candles as a tribute to the teenager. Amber Garcia, Ortiz's girlfriend, remembered him at the vigil as "passionate and brave and smart and outgoing," according to KXAN News. "Two years wasn't enough," Garcia said, referring to their relationship, shaking her head and sobbing. "It wasn't enough." In a tearful interview with KVUE News, two of Ortiz's neighbors said the teenager could often be found sitting on the porch greeting others as they came home and asking how work had gone that day. Though Ortiz had left Blinn College after a couple semesters, he had come home and gotten jobs so he could be closer to family, his grandmother, Paula Watrous, told reporters Friday. "A great young man. A great athlete," Watrous said, according to the Austin American-Statesman. "He had ambitions. He was very career-minded. In his career, he wanted to be a coach and a teacher. Those are the two things he wanted. . . . But he came home every weekend to be with his family. To be with his girl. To be with her family." As of Saturday morning, a GoFundMe set up for Ortiz's family had raised about $5,000. Chas Moore, executive director of the Austin Justice Coalition, a nonprofit that has been assisting the Ortiz family with legal arrangements in the wake of the shooting, said his relatives remained devastated by the "senseless" tragedy. "When I heard this story, I was just like, are you kidding me?" Moore told The Post. "[Fireworks on the Fourth of July] is something we all just deal with for like 36 hours. For this guy to be so outraged . . . I don't know. I can't wrap my head around it."